Ruth and Naomi return, greeted by the townswomen and settled in. Both women I am sure feel unsettled. Naomi has near to nothing and Ruth not much more than that; Ruth goes right to work to earn a living for the two of them. Boaz, Scripture describes, is a mighty man of wealth; well known in the city and highly respected. Boaz was David’s great grandfather. I expect he was a great influence on his children and grandchildren, for Solomon in the building of the Temple, erected two beautiful brass pillars in front of the Temple; one named after Boaz. (See 1Kings 7). 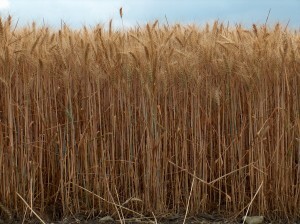 Ruth desires to take care of Naomi and leaves to find a field in which to glean. By chance, she finds herself in the field Boaz owns; this is no accident. Before she arrived at his field, God went before her and made a place for her. She does not know that the field belongs to Boaz when she asks to glean. I find it important to note, that Ruth suggested to Naomi to go work in the field. We know that the Lord commanded the Israelites to leave portions of their field un-harvested, leaving food for the poor ( Lev. 23). Ruth it seems is now well aware of God’s commands. She also is aware of the need to eat, but she is aware of the law that enables her to glean. Ruth is displaying her strength and determination. She could have moped around and had a pity party, like Naomi, but she keeps pushing ahead, she knows there is something better for her than her present situation. Naomi and Ruth arrive at the Passover (salvation); Ruth is now growing in God, learning His Law. Ruth has a good heart; the heart of a servant, and a strong work ethic. It is not beneath her to glean in a field. She needed to eat, the harvesters made notice of how hard she worked and that she was not idle. They make mention of this to Boaz when he arrives and asks about her. He immediately takes notice of Ruth and inquires about her; there was something special about her and he noticed. There must have been much talk about her in the city. The reapers knew who she was, though she did not tell them, she simply asked for permission to glean. However, Boaz notices her and immediately she finds favor with him. When we are obedient, God grants His favor. When you arrive in your place of destiny, you will find that God has already prepared the way of favor for you. Ruth is not treated as an alien or even as one of the servants; Boaz has given her a position even above the servants; God’s favor poured out upon her. It is important to note again that Ruth did not earn favor by sitting around and watching “As Bethlehem Turns”. I jest but the principle remains. We have to take steps of faith and do something; God is not going to provide when we do nothing. In the wilderness, He provided manna for the people, but they still had to gather it for themselves. I f we are willing to work and walk, He will reward us. Ruth has been faithful; Boaz has placed her above his servants and gives her access to what the servants gleaned. In the natural, Ruth is a poor alien. She has no place of position, but that is exactly how God’s favor works, and now the servants are working for her. It is important to remember that Ruth is a foreigner; everything about her is different from the women in Bethlehem. Most of the time, even though foreigners were allowed to glean because of the Law, they were treated poorly and sometimes abused. He assures her he has provided protection for her; with Boaz, she is safe and secure. Ruth is also humble in heart, she does not think too highly of herself. She could have boasted in front of the servants or given the girls that look, you know what look I am talking about! Ruth did not, she could not even look him in the face; she was so honored by his graciousness, that she fell down and submitted herself to him. This is such a beautiful illustration of our walk with Christ. Once we are saved, we learn His law – He writes it on our hearts, and we submit to Him as Lord. Boaz instructs Ruth not to glean from another field, and to stay close by his servants. He is saying to her do not look to another to be fed or provided for. He is now her source and she need not look anywhere else. When God plants you somewhere this is what He expects of us. He does not want us church hopping; you cannot grow if you are not planted. Stay where God puts you, do not move until you see the cloud by day or the pillar of fire by night ~ until God leads you. Ruth is obedient and is in line for a reward. Boaz has given her security and safety, but he attributes it to God and assures her she will not be disappointed. Again, Ruth acknowledges she does not deserve his favor and remains humble before him. He comforts her by letting her know he knows the journey she has walked; that she has suffered much heartache. When God has you walking a journey, it gets very lonely. Sometimes people around you have no idea what you have walked through to get where you are. God sees to it you have no one but Him to depend on. When someone recognizes that you have walked a hard journey and understands what you are going through, it is very comforting. This is especially true in a woman’s heart. Kind words always heal.